In addition to the email campaign and form statistics available in your Sign-Up.to account, you can also gain further insight via Google Analytics. If you have a Google Analytics account set up for your website you will be able to link it with your email campaigns and any data capture forms you create within your Sign-Up.to account, allowing you to further track subscriber interaction on your website. To enable Google Analytics tracking for your email campaign, simply tick the option within the Save screen when creating your email campaign. Please note: if your email campaign includes a link to a website that does not have Google Analytics in place, enabling Google Analytics for the campaign may break the link. In most circumstances though the website should be able to handle the extra tracking inserted for Google Analytics; we advise sending yourself a campaign preview and testing all links before you send your email campaign to your subscribers. To view these statistics go to Acquisitions -> Campaigns -> All Campaigns. Here you will be able to see a list of all your email campaigns. The campaign listing will appear in the following format: Company ID-Message ID-Campaign Name. Any of these parameters can be used to search for a specific campaign within your Google Analytics account. Once you have located the email campaign(s) you'll see recorded statistics such as sessions created, new users, average session duration etc. Please note: campaign statistics take 24 hours to populate. The default campaign view shows the last month of campaigns; if you need to see more historical campaigns you can change the date range to suit. There is also a Real Time area which shows you any subscribers that are visiting your website currently, as a result of clicking a link within one of your email campaigns. To view these statistics go to Real Time -> Traffic Sources. Click on 'Email' to see a list of email campaigns that have successfully directed visitors to your website. You will then be able to click the relevant email campaign and view the number of 'active users' at that point. Within your Google Analytics account you will have a tracking code starting 'UA'. This can be found by going to Admin -> .js Tracking Info -> Tracking Code. Add this code to your form in your Sign-Up.to account by editing your form and clicking 'Options' in the top right-hand corner of the form builder. This opens the form options window. 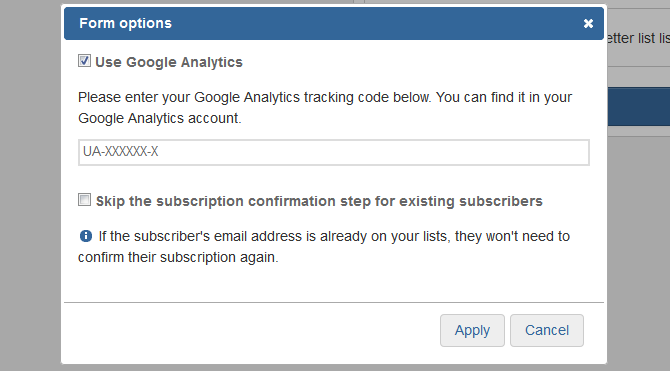 Check the box to switch on Google Analytics tracking and then enter your tracking code. Finally, click 'Apply' to close the window and then 'Save' your form. Google Analytics tracking will now be added to your form and the results will appear in your Google Analytics account. Please note: if you have previously added your form to your website using the open HTML feature, the code will need to be updated with the added tracking information to begin sending information to your Google Analytics account. Once your form(s) are linked you will be able to see each part of the form viewed by your visitors. This includes the first page of the form, the confirmation page (if applicable) and the thank you page. These statistics can be viewed by navigating to Behaviour -> Site Content -> All Pages. To narrow down the page listings, use the search bar and enter 'form' or enter your Company ID contained within all your data capture form links. If you're not sure on your Company ID, you can find this within your Sign-Up.to account by going to the cog icon and selecting 'Account'. Please note: statistics take 24 hours to populate. There is also a Real Time area where you're able to see if any subscribers are currently viewing the form you have linked with your Google Analytics account. To view these statistics go to Real Time -> Overview or Content. Both these pages will show you the form page(s) that are currently being viewed and you can click through to see the 'active users' for each specific page.